Continuity mistake: When Sylvester and the dog are fighting in the cage, Tweety rushes out of the door to see them and he is initially standing well away from the door mat, but in the next shot he has moved a few inches back. Continuity mistake: At the beginning of the short, Tweety's cage has a swing inside it, but when Sylvester hides in the cage later on, there is now no swing. 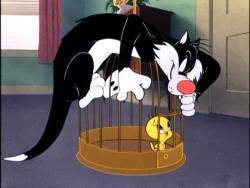 Continuity mistake: When Sylvester (dressed as a cleaner) sneaks up on Tweety's cage to capture the bird, he puts his dustpan and brush next to the cage. But when we see Tweety standing next to the cage, the dustpan and brush have gone. Continuity mistake: When Tweety hits Sylvester on the paw with a mallet, the background behind Sylvester changes between shots.